After a photograph of an emaciated polar bear hobbling on ice went viral online, some people are wondering if global warming is causing these majestic creatures to starve. 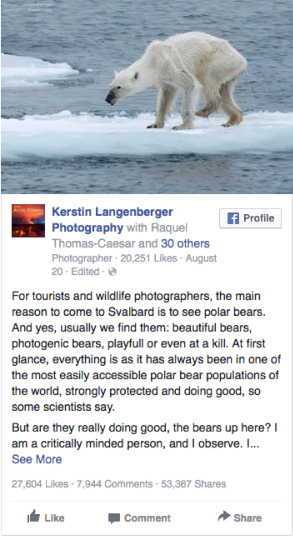 Photographer Kerstin Langenberger, who snapped photo, wrote a concerned Facebook post questioning the health of polar bear populations. But the photograph is misleading, said Karyn Rode, a wildlife biologist at the U.S. Geological Survey in Anchorage, Alaska. “I think you are always going to have animals in any population [that are] in poor conditions,” Rode said. This can be because they have an injury or because the animal is old, she said. There are 19 recognized polar bear subpopulations, but only two have been studied for long enough to show that changes in ice conditions are affecting their livelihood. Sea ice is the home of polar bears’ major food source, ice seals, so when the sea ice melts, so does the bears’ main way of getting meals. According to the PBSG, the global population of polar bears has not declined over the last 30 years. 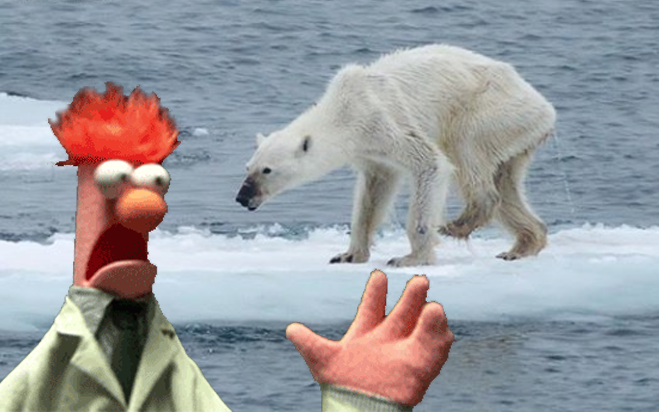 Yes indeed, particularly since the bear in the photo is in fact walking on… sea ice. But somehow this observation was lost in the rush to panic.